Andrew Breitbart explains the Alinsky tactics both the Administration and the Democratic Party are using to discredit the tea party movement. Attempting to provoke a racist incident on the Capitol steps, lying about being called racial epithets, falsely depicting some fringe elements of the movement as representative of the whole, characterizing the movement as “angry” and “hate-filled” when it is no such thing, are all attempts to use Alinsky-type tactics to isolate, marginalize, and demonize those who would stand up against Democrat Party tyranny. The race baiting of the Tea Party crowd on the Capitol front was caught by calling the Democrats out — and they didn’t deliver the goods. The attempt to incite a reaction from the Nevada Tea Party was even worse. They were the violent ones, who traveled out of their way to provoke an incident — and when they didn’t get it, they blamed the victim. IT’S ON TAPE. And the person lying on camera to the police is the field director of the Nevada Democratic Party. Over at Media Matters, Podesta’s den of deceit, the phantom egg has turned into Breitbart mockery over easter eggs. Change the subject, misdirection, their side caught with their pants around their ankles, don’t look there media, there’s nothing to see here. The Democrats need to kill the Tea Party movement. They need to marginalize and demonize those who would stand up to their hardball, toxic and anti-democratic tactics. Their strategy is to bait and incite the Tea Party and to use whatever they can get to silence the awakening giant. They have failed, epically, and the American people now see these tactics for what they are. At long last, new people every day are beginning to understand the kinds of people we are dealing with here. Will the media keep falling into the trap? Their business model continues to fail each and every time they are suckered – unless, of course, they are doing it on purpose. The Republican Party failed in its attempt to make good with the Tea Party when its leaders apologized for it. When will the GOP stop playing Charlie Brown to the media’s Lucy? The Democratic party has been exposed as trying to create a Kristallnacht to save the Obama presidency along the fault line of race and the essence of the First Amendment. If the GOP does not have the intestinal fortitude to fight back, a growing number of disenchanted and disenfrachised Tea Party participants will have to do it themselves. Who is calling the shots here? Is it the White House, by way of Chicago? Or is it Nancy Pelosi and Harry Reid? The press refused to tell you the truth about this president. It refused to tell you of his proud adherence to the teachings of the original Chicago “community organizer” Saul Alinsky. We have now entered the first full-fledged Alinsky presidency. 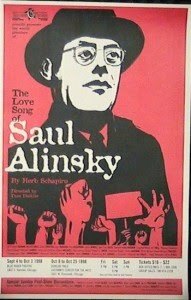 The only way to beat Alinsky is with Alinsky. The Democrats and President Obama will not give up this tack. Do you think the GOP will win the day in November and in 2012 if its strategy is to apologize for every manufactured “right wing fringe” outrage? With President Obama over the last week calling attention to the Tea Parties and their “heated” rhetoric, he has officially connected himself to the civil war his minions have flailingly attempted to inflame. The only good thing to come of this is that we can now officially put to rest the laughable notion that Obama was going to be the first post-racial president.